Early figures in Argentine history are usually the most complex to document because they participated in almost every major event. National population was smaller, the elite kept themselves in power & most military figures ran parallel lives as politicians. Adding to the mix were powerful alliances, & Argentines became involved in events spanning half the continent. Wenceslao Paunero was no exception with a lifelong military career & political allies among the most recognized names in Argentina. 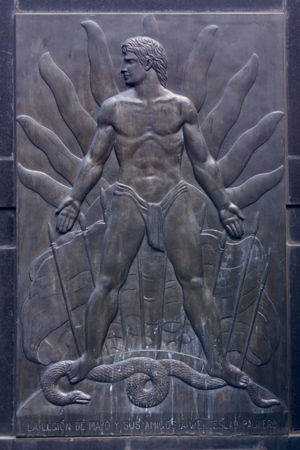 Born in 1805 in Colonia del Sacramento, Paunero was a child during Argentina’s independence from Spain. At the age of 20, he joined the Argentine army & fought for his hometown during the 1825-28 war with Brazil. Although captured & later freed as part of a prisoner exchange, it did not hinder Paunero from moving up in the ranks. Paunero later joined forces with General Juan Lavalle, participating in battles throughout northern Argentina & negotiating with opposition forces led by cuadillo Juan Facundo Quiroga. After exile experiences in Bolivia & Perú, meeting Domingo Sarmiento & Bartolomé Mitre in Chile brought Paunero into new political circles. Paunero fought against Rosas & was consequently promoted to the highest military position Buenos Aires could offer. Once internal issues were somewhat settled, Paunero had little time to rest. Under the presidency of Mitre, he was sent to command troops in the War of the Triple Alliance. Mitre later promoted Paunero to Minister of War/Defense & in 1868 he ran as a Vice-President under a losing ticket with Rufino de Elizalde. Always serving his country, Paunero passed away in Rio de Janeiro as Ambassador to Brazil in 1871 at the age of 65. His tomb was declared a National Historic Monument in 1946 & sits quietly at the end of a row that very few tourists visit. 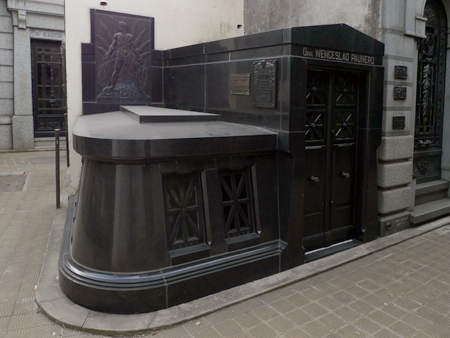 The modern style does not fit with the date of Paunero’s death, so most likely a later family member had this built & his remains transferred to Recoleta Cemetery.